This lovely property offers 2 bedrooms with the added facility of a double sofa bed in the living room making it suitable for up to 6 people. It also has an en-suite to the master double and a family bathroom and 2 car parking spaces so is more than adequate accommodation for a larger or extended family group. 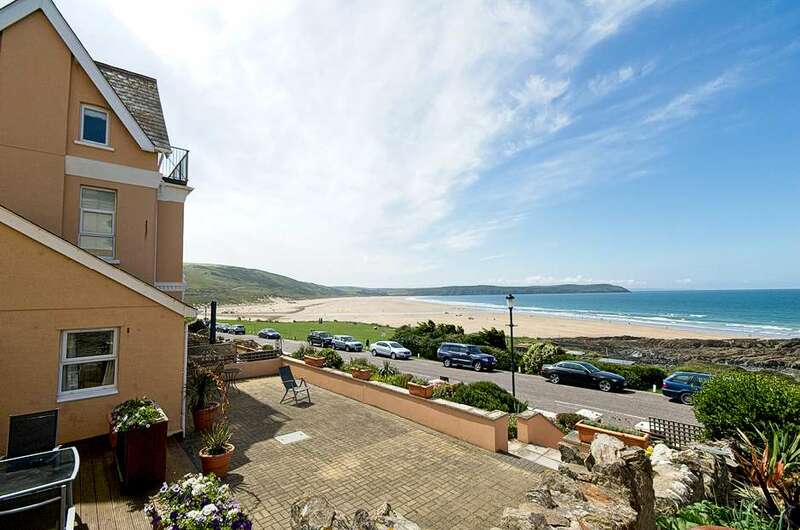 The best of the view can be taken from the main living area with its large picture window facing the sea but probably this apartments best feature is its abundant 60 foot landscaped frontage outside where you can relax. This whole area has just undergone an overhaul and now has smart grey non slip composite decking to the side and It is equipped for summer barbeques on the large terraced area with garden furniture comprising a table and 6 chairs together with sunbeds (new photos soon). There is even an outdoor shower for rinsing sandy wetsuits and people! The views from the front extend to Putsborough and beyond with the entire sands of Woolacombe beach in front of you, simply stunning!! In the open living space are 2 sofas, one being the sofa bed previously mentioned. The solid oak dining furniture has 6 chairs. In this room there is a Flat screen Freesat HDTV, DVD, and WiFi plus a radio/CD player/iPod dock with cradles to suit most models. There is Freesat digital in both bedrooms as well. This main living area has laminate flooring. The bedrooms and hallway are carpeted. The kitchen dining area has an electric cooker and gas hob, dishwasher, washer/drier, microwave, fridge freezer and plenty of storage in oak fronted units. Both bedrooms can accommodate 2 people in each, the master ensuite has a double bed and the second smaller bedroom has twin zip’n link single beds so the choice is yours. Please advise whether you require 2 x singles or a superking when you book. Travel cot and highchair provided upon request. Access to the property is good and has no steps so could be suitable for partially disabled or the less mobile and one of the car spaces is level with the front door. The other parking space is off the road behind and down steep steps. There are also a few steps down from the terrace to the road. Up to two dogs are welcome at Stepping Stones but should be restricted to the non carpeted areas please. The owners have kindly supplied a folding dog cage measuring 36”x24”x28” and is classified as - large. This will enable you to leave dogs unattended should you wish to leave them for a while. There is an occasional day visitor parking space on a first come first served basis shared with the other apartments so can’t be relied upon being available. All in all Stepping Stones is a fabulous seafront property offering everything people want for a coastal holiday. A £150 security deposit will be pre-authorised and then released again after the holiday. The owners don't ask for an extra charge to bring a dog but £50 could be deducted from the damage deposit if excess dog hair is found.